Croatia’s largest political party in opposition – HDZ (Croatian Democratic Union) – had Monday 29 June released its platform or program for economic recovery (employment growth and investments …) and that, in itself, one could say is nothing special – we’ve seen it all before, especially during pre-election times and Croatia is heading for elections either end of this year or early 2016. However, although all details have not been presented at this time, this particular initiative by HDZ contains the contours of very promising elements, placed at the helm of the program, that could noticeably revive the sluggish, dying economy to a buzzing atmosphere of doing business in Croatia. In particular, propping up and supporting small and medium size business, as a priority, through new avenues of financial subsidies and sources, and de-institutionalising and reforming public administration and government front-line services – making them more user-friendly – are two elements that stand out as promising! While the current Social Democrat led government had in its election campaign of 2011 relied on the so-called Plan 21, which contained some of the elements of HDZ’s economic platform, it would seem that HDZ’s platform has a better chance of achieving real outcomes as goals are more focused and better defined while the similar goals put out by Social Democrats were in fact too generalised and lost among too many goals and aims. When the Social Democrat led, Zoran Milanovic government came to power in December 2011, it held a fairly progressive, albeit too wide to my thinking, policy aim to rekindle economic growth and create a more equal society. For this, a vibrant investment program was to be created to raise capacity and improve productivity, as well as some redistribution to the lower wage earners that would boost consumption and demand. But the government went about achieving fiscal consolidation as a priority (sacked its finance minister Slavko Linic, mid-stream, who preferred structural reforms to fiscal consolidation) and most of the economic growth goals fell by wayside and weren’t getting picked up by anyone, not in any sense that would produce noticeable results. Hence, in the atmosphere of persistent recession, this approach added to increasing loss of production capacity particularly through company winding downs or bankruptcies. The danger of continuing with the current government’s policy in that the resulting lower level of output and productivity engendered by the long recession coupled with an incompetent government may become a permanent feature of the Croatian economy and Croatia will never get on stable and solid feet economically. The bright point in HDZ’s newly released economic platform, which gives priority to stimulating small and medium business growth, is that such a path can not only preserve the existing capacity to produce but also cause growth in production capacity which, in turn, would respond positively to a path of resumption of economic growth in Croatia and the EU. Zoran Milanovic’s government simply did not offer adequate attention to developing the small and medium business sector but let that idea slide. Perhaps because that is not in the left-wing ideology or belief (?). Small and medium business enterprises are seen as agents that stimulate domestic demand through job creation, innovation, and competition, which makes them a driving force behind a resilient national economy. Access to finance is a critical factor in the development of small and medium business enterprises upon which a country’s economy relies. HDZ seems to have recognised this challenge and in their economic platform address new sources of financial stimulation and support for small and medium business, including smart and invigorated path in the usage of available EU funds. Overall, the current centre-left government has had a dismal record in managing the Croatian economy, which has continued to drag in recession for over six years, far longer than most European countries. One would have thought that the recession itself would have been motive enough to get up and work harder at bettering the Croatian economy – but this did not seem to be the case with the government in Croatia. So, the picture we have now is this: an increasing number of young people are neither in education, employment nor training, leaving Croatia in search of work, while the proportion of people at risk of poverty and social exclusion has increased to levels significantly above the EU average. During the last six to seven years Croatia has lost above 13 per cent of its gross domestic product. Unemployment is above 17 per cent of the workforce, and among young people the rate is close to 50 per cent. This is a social disaster enveloped in an inefficient public sector that keeps people in jobs that serve no obvious public purpose beyond disguising true levels of unemployment. Not much different to what it used to be under former Yugoslavia – multitudes of jobs without real purpose, without real productivity, without earning the wage through sales of products produced. This is a problem that is magnified by a severe shortage of private sector companies capable of creating jobs by competing successfully in EU markets. The objective of the economic program of the Croatian Democratic Union (HDZ) is to launch employment, instigate a serious economic growth and deal with everyday problems Croatians are faced with. According to HDZ the backing for this enviably bold platform includes new investments and new finance sources for entrepreneurs. The German Munich-based IFO Institute was reportedly engaged by HDZ to contribute in the drawing up of the program. “If we win government, our tax policy will be directed towards stimulating small and medium business, that is, stimulating the creation of new jobs,” said Tomislav Karamarko, leader of HDZ. 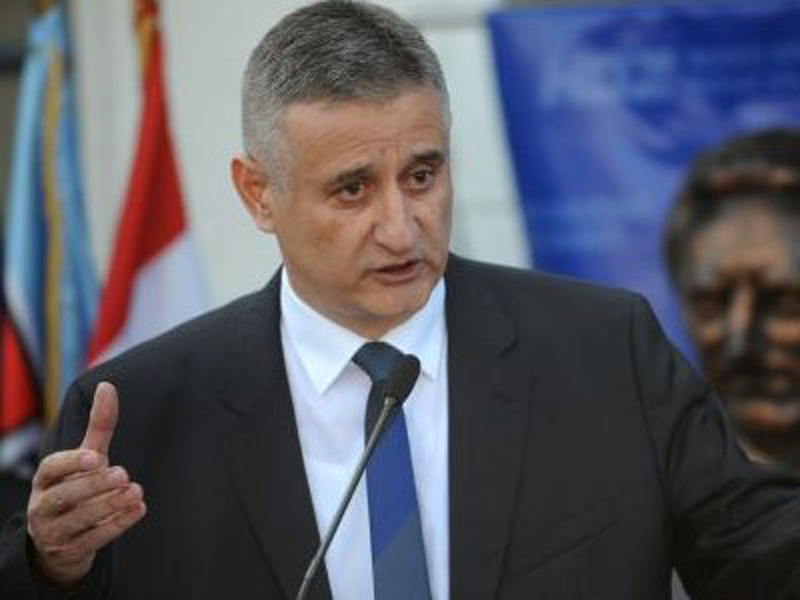 HDZ thinks, it seems, similarly to Carlos Pinerua, head of the World Bank’s office in Zagreb, who recently said that the main problem was the poor business environment, stifled by frequently changing regulations and red tape, particularly on the local level, which made it difficult to set up businesses. “Such an unfavourable climate especially hurts small- and medium-sized enterprises and they should become the main growth and employment driver,” Pinerua said. Thank you for letting folks (me) know what Za Dom Spremni meant – my better half (Croatian) tried to explain it but your article said it better – I am not Croatian myself but I am a soccer fan & I am tired of seeing a country, so rich in talent, get screwed by political correctness. In my response, I let people know that I got my ‘translation’ from your site and how long it’s been used. I doubt many people read my response, but please know I gave credit to your site. Hi inavukic. I’m not Croatian as well, but you blog is so interesting. You keep me posted on all the latest news from there. Thank you. I wishing peace for you and your Country.. I think that HDZ should make it part of their political-economic agenda to join the Visegrad Group. I was shocked they didn’t make it a top priority. Croatia can learn a lot from Poland, the Czech Republic and Slovakia, and can push its geographic importance for global trade as the entry point and exit point for goods going to and from the hopefully V5. This is a strategic priority. Also I believe that gradually decreasing the VAT tax for citizens progressively over ten years to a rational rate (15 percent – which has worked wonders for Ireland) – while setting FDI investment into whole foods production and industry at zero for the first year with a graduated increase over a decade ending at 15 percent, would be wise. As long as there is red tape for businesses to deal with with a 25 percent tax rate, there will be no major FDI – ever.